This tube worm differs from other tube worms because it has two spiral crowns. 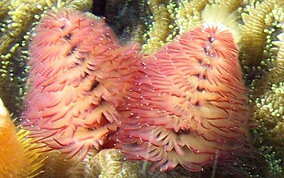 Most other tube worms have just one crown of radioles. They are very common and inhabit all areas of a reef environment. They are small (compared to some other species of tube worm), with crowns of about an inch to inch and a half tall. Their colors vary from white to brown, pink to purple.